Hailing from Tampin, Malaysia, Nasty Juice was founded in 2015 with the intention of becoming a world-renowned, global brand and they’ve certainly lived up to that promise. Co-founders Pak Din and Mr Loky entered the industry with a vision: vape juices and e-liquids that embodied a daring and playful spirit. 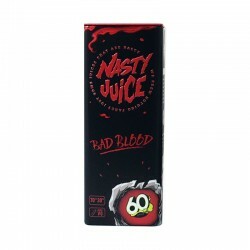 Their unique branding and commitment to quality control has seen them explode onto the scene, with Nasty Juice become a big seller in the Middle East, the United States and, of course, here in the UK. Nasty Juice’s range of e-liquids certainly delivers in terms of flavour. Using a 50/50 and 30/70 PG/VG base, they have a smooth draw whilst allowing for the creation of satisfyingly large vapour clouds. Whether you favour subtle tones of honeydew melon (Devil Teeth), the tang of pineapple and lime (Slow Blow), or the freshness of green apple (Green Ape), there’s a Nasty Juice for you. Nasty Juice has always maintained that their customers are as much in love with the brand as they are with the high-quality e-liquid they produce. With a distinctive graphic style and their famous metal dropper bottles, you’re never in doubt that it’s a Nasty Juice product you’re using. They’ve extended their brand to include clothing, accessories, and even skateboard decks, targeting the alternative demographic that makes up much of their user base. Nasty Juice is one of the few e-liquid companies to address the distasteful matter of counterfeit vape juice head on. Knowing how poor quality knock-offs can impact on their reputation, their website shows clear instructions on how to spot a bootleg Nasty Juice product. Needless to say, we only ever stock the 100% genuine article, here at F&S E-Cig. All Nasty Juice e-liquids come as either 10ml bottles (in 3mg, 6mg and 12mg varieties), nicotine free 50ml short fill bottles, or 10ml nic salts (20mg). Many are also available in multi-packs to maximise your spending power. Our complete range of Nasty Juice e-liquids is available to purchase today from our online store for speedy delivery across the UK. Or, if you’d rather, feel free to pop into one of F&S Central London-based vape shops and pick up the Nasty Juice of your choice in person.